Home » Posts tagged "Increase of Utility Cost of Apparel Industry Special Skilled Manpower of Apparel Industry"
The demand for garments is increasing day by day with the increase in world population. Bangladesh, India, China, Vietnam are contributing a huge amount to the production of garments which increase their market share to the apparel industry. Textile and garments always had challenges and now still has challenges and in future, more challenges will come. Those are involved with the apparel industry will need to carefully manage future challenges to stay in the line of success, otherwise, they will have to either bear monetary loss or decrease their business growth or decrease their market share. 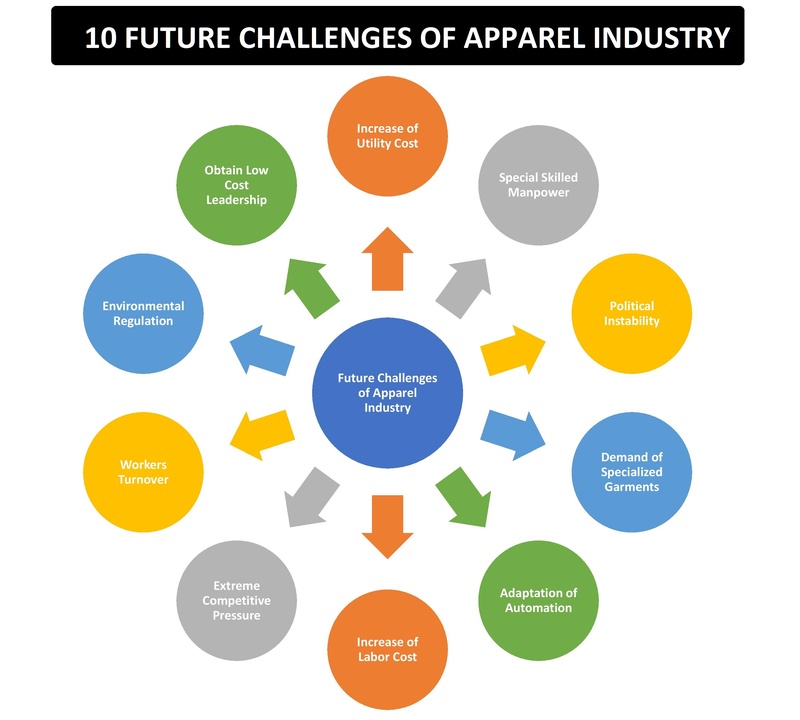 From my experiences right now, I can see there are 10 Future Challenges of Apparel Industry with which we have to deal with. If you are aware of these challenges, then hopefully you will be the gainer by planning for the future. Utility cost will likely to increase by a significant amount within the next few years. In a textile and garments factory, four types of utilities are commonly used; Electricity, Water, Steam, Compressed Air. Among these, electricity is the main part of the utility because electricity can be used to get the other three. Normally there are two types of a generator is used to generate electricity in the garments factory in Bangladesh or any other country. One is Gas Fuel and other is Furnish Oil/Diesel Generator. The cost of Electricity generated by Gas Generator is lower. But if you use diesel generator then the cost of electricity production will increase by two to three times. Here in Bangladesh, we have a very limited source of natural gas. Soon or later our natural gas will be finish then we will not get natural gas for industrial electricity generation purpose, so we have to rely on the diesel or any other renewable energy source. If we can not get a solution for lower cost electricity generation then this will increase our overall garments production cost. The solution to this problem is the government can provide electricity to the industry with the power distribution authority. To do this first of all government need to ensure high capacity power plant across the country. The Bangladeshi government is already taken initiative for the nuclear power plant, although it has a high risk for the environment if an accident takes place. To make some innovation it is required to get some skilled manpower. Through special skills, special and specific tasks can be done effectively and efficiently. Special skills like; handling CNC machine, Design PLC, use of CAD, etc. For the garments sector, most of the garments works are not well educated, it is not easy to get and manage especially skilled manpower. So, this will be a big challenge for apparel industry owners. The solution to this problem is, adapt more skill development program, like SEIP- Skilled Employment Investment Program taken by the Bangladesh Government under Finance Ministry. This program is designed in such a way that people will get training then development and also ensure related job placement. This development is a role model that can be followed by other countries that are in the development stage of the apparel industry. One of the main problems for Bangladeshi entrepreneurs is political instability. A democratic government is required where the will be political stability which is a pre-requisite for the positive growth of the industry. The country which experiences frequent strike on the transport system will face the problem of a delay in shipment. And a delay of shipment can be the reason for canceling the shipment, or monetary loss or losing the valuable customer. So, for positive garments business require a positive political condition. Near future, Bangladesh is at high risk of political instability. It is the time of thinking by the owner of the garment’s how they will deal with this challenge. The easiest solution can be taken by the ruling government to ensure a stable political condition for their country. The main target market for apparel export is for USA, Europe. As their living standard is higher and becoming more higher, they were concerned about fashion and will more concerned about a special fashionable dress. So, it is a huge challenge to industrially make fashionable garments at low cost. To deal with this future challenge of the apparel industry, garments owners have to think about it and invest in research and development of fashionable clothing. To minimize the risk of a demand for diversified fashionable garments, lots of creative fashion designer and industrial engineer will be required to make specialized garments item. Advanced technology helping us with the adaptation of automation in every industry. Lots of innovation already has been done by which many garments already increased their productivity, where fewer men power is used. Men power is replaced by advanced technology; this means the machine is replacing the human being. Although automation is not possible for every section of the textile and garments industry some of the section of garments can be automated which will not only increase the effectivity of the resources but also increase the effectiveness of overall operations. As an industrialist, you will face this challenge if you do not have enough knowledge of technology and how and from where you can adapt automation for your industry. To deal with this challenge you must invest in developing skilled mechanical and industrial engineer who will be responsible for bringing automation to your factory. They will design and make a customized machine for the different section of your factory. We have found that worldwide labor cost is increasing year after year. China and India are facing these challenges much compared with other countries. As the garments industry is more labor-intensive industry, this industry requires more men power. So, this challenge is unavoidable challenges. This is the reason why Chinese companies are shifting around the world, they are choosing Africa, Bangladesh for their suitable investment region. To deal with this increased labor cost challenge, garments industry should work with increasing the productivity of the workers which will reduce the per unit manpower cost. Another thing is, proper training and development plan must be adapted so that you can ensure disruption-free production. You know, competition is always there for you, it does not matter where you do your business. The apparel industry is a very lucrative investment opportunity for business personnel because it brings a huge profit for them. But it is not easy to gain a huge amount from this competitive industry, the first condition is you need to offer a competitive price for their product. To deal with this challenge, all you need to do, first analyze the market, analyze the sourcing of materials and your export market and then target accordingly. If you conduct a proper analysis you will definitely find a market for your product from which you can generate enough revenue for your company. Worker Turnover or employee turnover is one of the common problems and it is a challenging task for textile and garments owners because as long as they are unskilled they will like your job but when they become skilled, they try to switch one company to another company. The problem is, you provide training to the unskilled worker to make them skilled but after becoming skilled they are not always promised to give their valuable output to your company. It is something like you are extracting juice from lemon but cannot take the juice on your own. You are losing your skilled worker, losing your invested money and also opening scope your competitors to steal your best workers. I personally consider this problem as the biggest challenge for the apparel industry. But the question is, how to get rid of this problem? The easiest solution is; you need to provide a competitive benefit to your workers. First, understand their needs and provide their needs, it can be a monetary or non-monetary benefit. In the apparel industry, the textile is producing a huge amount of waste, especially chemical is used for dyeing, printing, washing which is ultimately dumped into the river water. A huge quantity of water is used for garments washing and there is no efficient scope for reusing this water. Because of the apparel industry, our water is not only polluted by industrial waste but also the underground water level is dropping. This is the reason why environmental regulatory authority is now more concern about environmental pollution. Garments buyers are now also concerned about the environmental effect of dumping of garments waste. Now it is mandatory to have ETP-Effluent Treatment Plant in textile and garments factory so that effluent can be treated before dumping into the river. Here the challenge is to set up an effluent treatment plant and manage it according to the guidelines of respective authorities which is a costly operation. To get rid of this challenge, as a garments owner, you need to find a solution from three different types of an effluent treatment plant and choose which is least costly for you. Nowadays, low-cost leadership is a challenging task because everyone related to the apparel industry trying to get the best solution where they will get low-cost leadership. As a part of low-cost leadership, they choose a decision to make or buy decision. In addition to this, they are always working for setting good supply chain management for their garments resources. So, as an industrialist how you can ensure low-cost leadership? All you need to do recruit a good financial analyst. Let him understand your business and its process properly. After doing a proper analysis, he will help you to decide which one is the best option for you. Another thing you can do is always ensure that you are well informed about what is going on in the industry and how trends are moving forward. If you are aware enough and take the right decision, then you must be able to obtain low-cost leadership in the apparel industry. After these discussions, hopefully, you understand what can be the future challenges for the apparel industry and how you need to move forward to stay in the right path of your business which may help you to generate enough revenue for your company.